Giant robots both big and small are a staple of the Japanese science fiction lexicon. They span not just movies, but television, too. These types of monsters often surpassed those seen in American SciFi movies with their elaborate weapon arrays and spectacularly fictitious technological designs. Where US SciFi frequently had an air of believability about it, the Japanese counterparts tapped into the imagination literally in a BIG way. 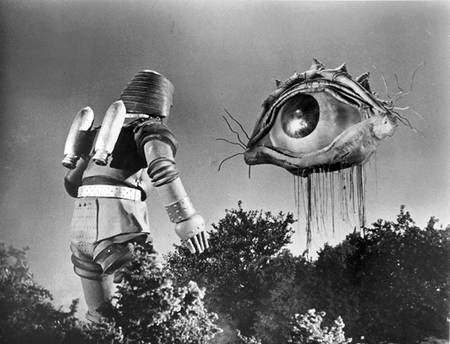 Of all the Nipponese robo-theatrics, Toho's robot monsters are likely the most famous examples of the form. 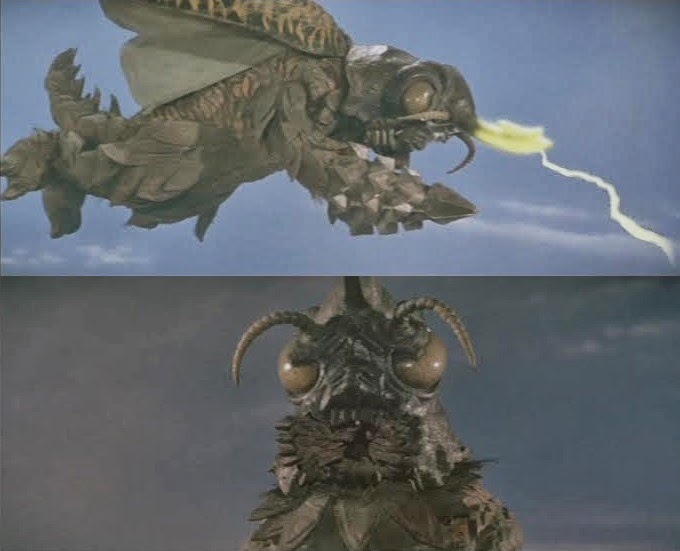 The first such mechanical menace from Toho surfaced in 1957s THE MYSTERIANS. Mogera was a towering juggernaut of alien invention. Equipped with those lovably old school 'beep beep' sound effects, Mogera looks like a cross between a metallic bird of enormous girth, and a tank. Other than its size, its main weapon is a splotchy, rapid fire blue laser that resembles those emitted from the warships seen in the original WAR OF THE WORLDS (1953). Mogera also has burrowing capabilities via the large drill on its face. Seemingly indestructible, Mogera's path of destruction is brought to an end when the military blow up a bridge the giant, slow moving robot was crossing. With its inclusion being an afterthought, it's no surprise that the Mysterian aliens prove to be more of a threat than their giant robot. 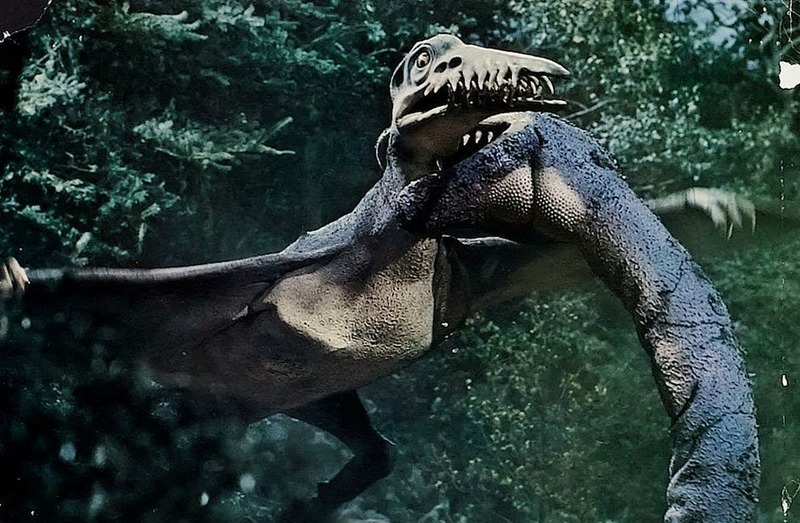 It would be nearly 40 years before Mogera would surface in a movie again -- minus the beeping. Ten years later, Rankin/Bass and Toho joined forces with KING KONG ESCAPES (1967). 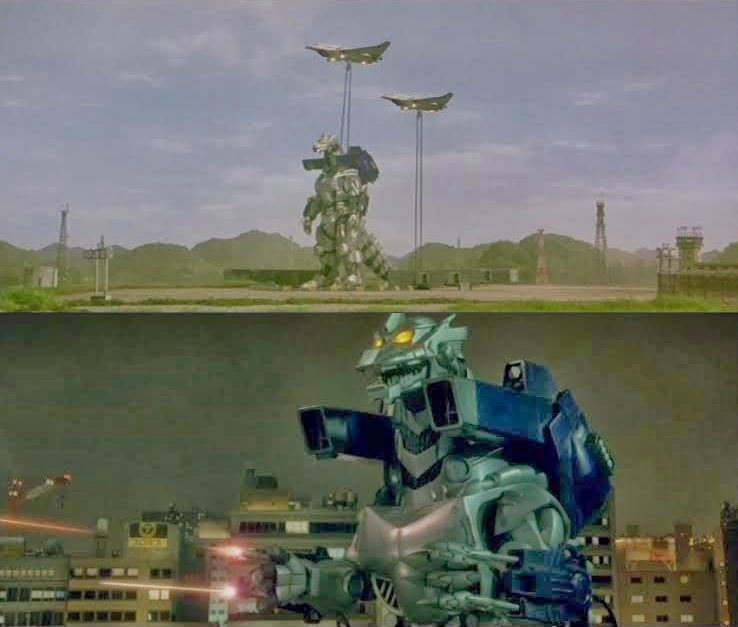 Based on THE KING KONG SHOW, a cartoon co-production between R/B and Toei, this live-action rendition brought forth Toho's second big screen giant robot -- beeping sounds included. Mechani-Kong was a cool concept, and was an impressive looking robotic wonder. Unfortunately, Kong's mechanical double had little in the way of super powers. He had a hypnotic beam atop his head, and his eyes emit a blinding light. 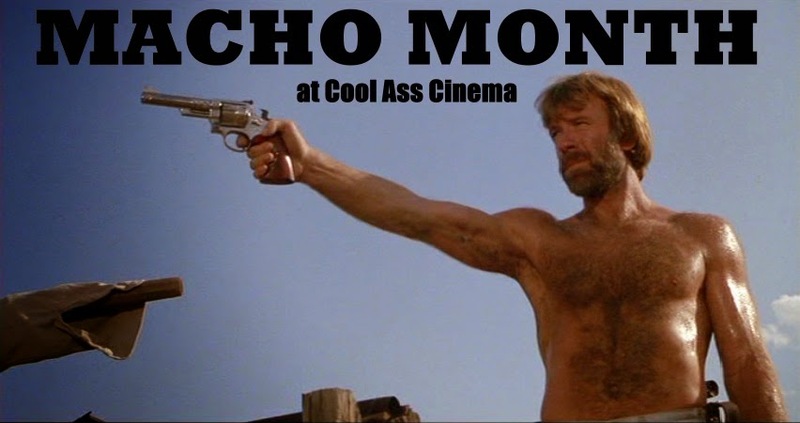 Other than that, the mighty machine's only other weapon is a utility belt aligned with grenades. Hiroshi Sekita does a fine job maneuvering inside the Mecha-Kong suit. 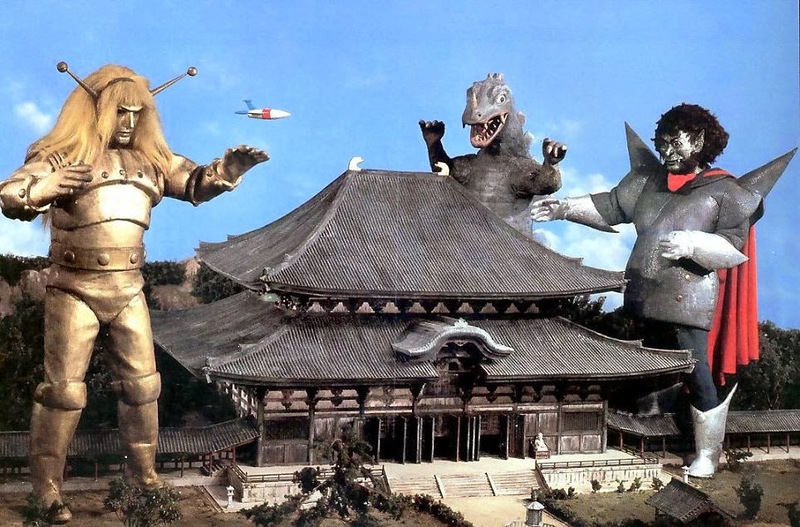 Despite their convincing suits, future giant robots in Japanese monster films would make Mogera and Mechani-Kong look like outsized oil cans by comparison. Kong's robotic double has threatened to emerge again over the years, but pesky rights holders for Kong's likeness has incumbered his second coming. 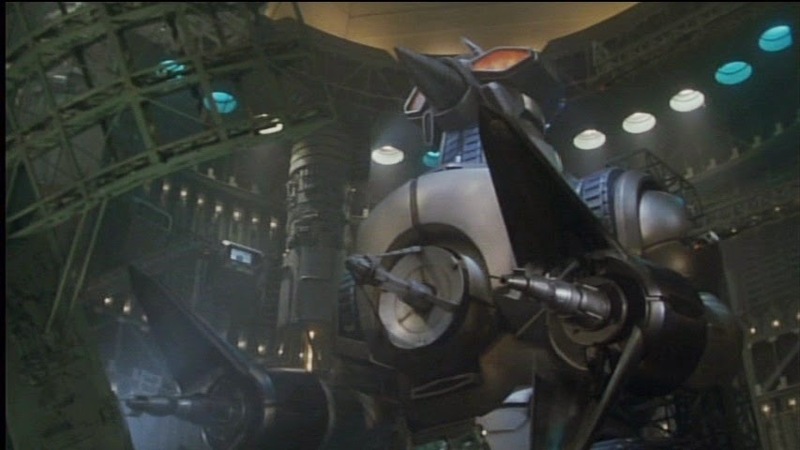 The 50s Mogera got an upgrade in 1994 in GODZILLA VS. SPACE GODZILLA. For its 90s incarnation, Mogera (or M.O.G.E.R.A. -- Mobile Operation Godzilla Expert Aerotype) was a man-made creation piloted by a three-man crew, as opposed to being guided by alien controllers. Another drastic change was the robot could now transform into two separate mecha -- the Star Falcon and the land module that could burrow underground. The two machines had their own laser mechanisms, too. Once together, this newer version of Mogera has some additional weaponry its 50s counterpart didn't have such as spiral grenade missiles and a plasma laser that was implanted in its chest. It could also move around on tank tracks when necessary. Even with all the flashy laser effects from the SPX 'Master of Beam Attacks', Koichi Kawakita, this new Mogera was just as clunky, and stiff as its 50s predecessor; only shinier, and plastic looking. 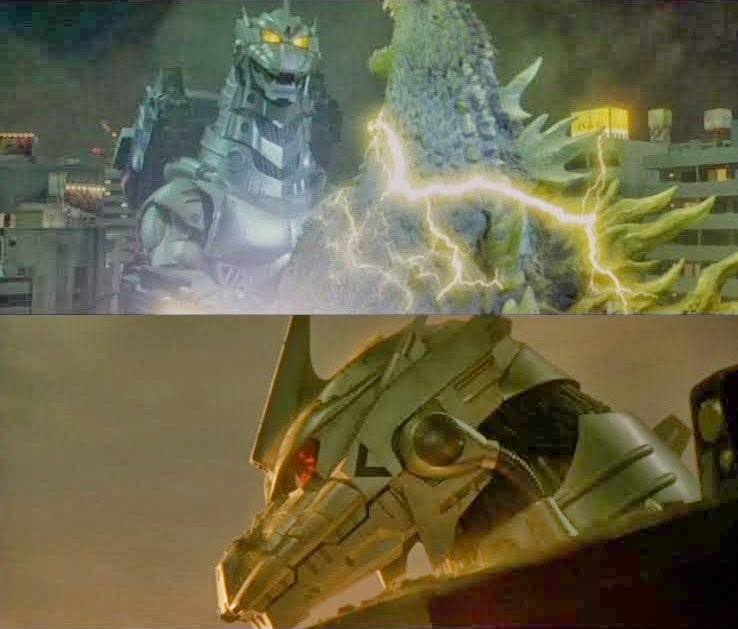 Mogera's inclusion here feels redundant since we'd already had a Mechagodzilla light show the previous year. 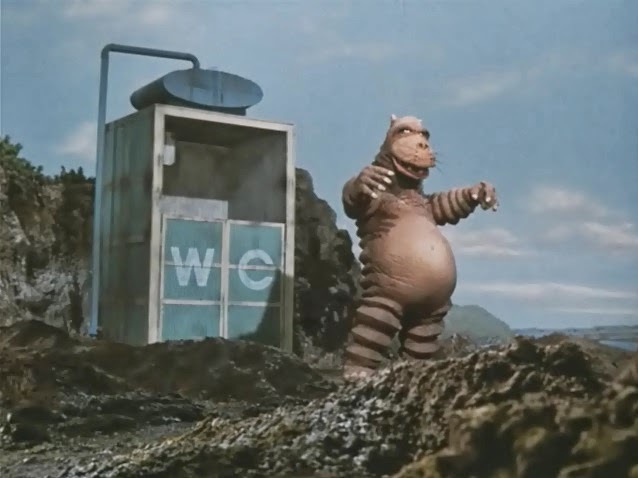 Still, the filmmakers found plenty for the upgraded Mogera to do in the '94 Godzilla picture. Wataru Fukuda was underneath the Mogera suit. 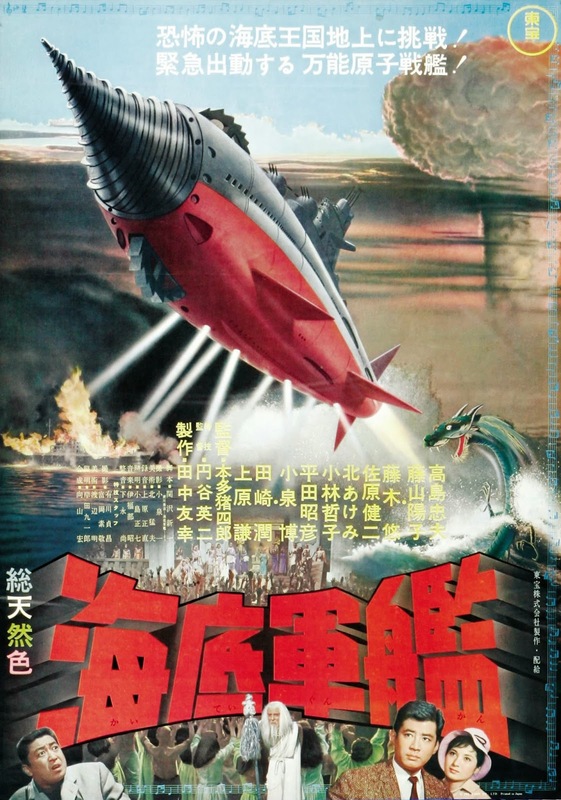 In the early 70s Toho introduced two offbeat, quasi robo-kaiju, Gigan and Megalon. Neither looked all that robotic, but the metallic appendages and mechanical devices attached to their bodies signaled cybernetic inner workings. Gigan sports a metal outer shell (even if it does look like rubber) that has a ridiculous buzzsaw built into its chest. A Nebula M Space Hunter (are they neighbors with the Third Planet Black Hole aliens? ), Gigan doubled teamed Godzilla and his tag team partners in both GODZILLA VS. GIGAN (1972) and GODZILLA VS. MEGALON (1973). 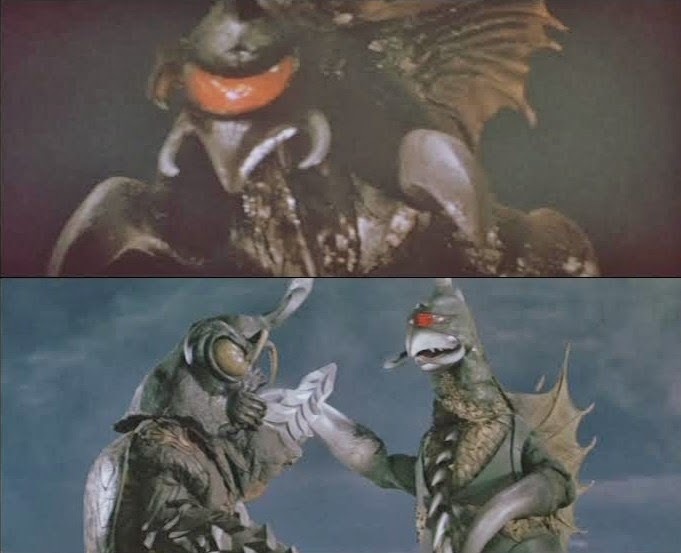 The most memorable aspect of Showa Gigan is that Kenpachiro Satsuma (then Kengo Nakayama) wore the monster suit in both films. 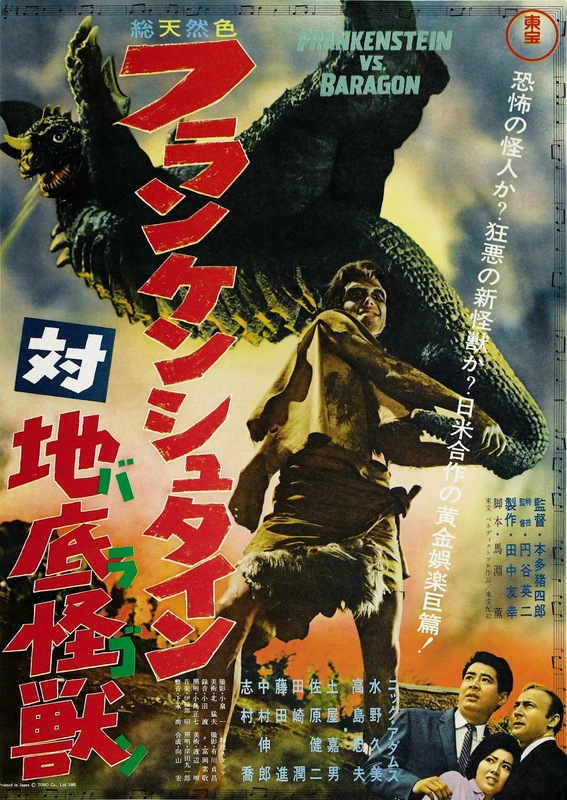 Satsuma would find fame among fans as the most popular actor to play Godzilla next to perennial favorite, Haruo Nakajima. 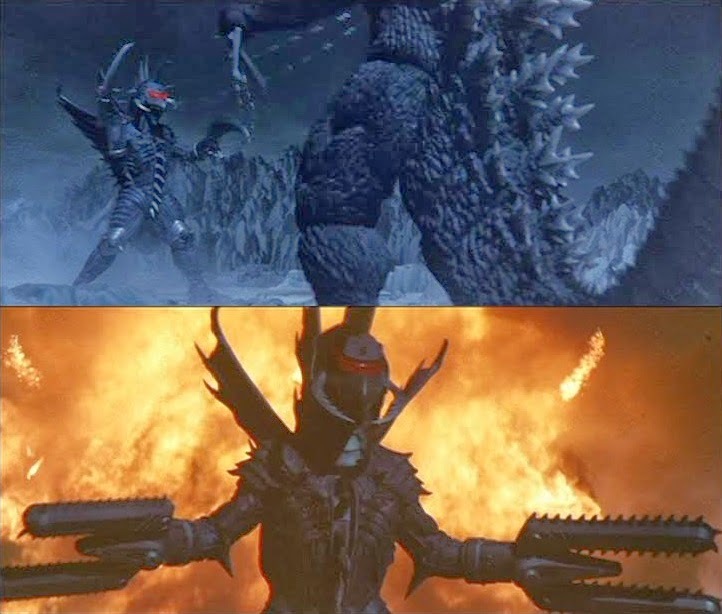 Gigan surfaced once more with a modified origin in the horrific Ryuhei Kitamura mess, GODZILLA FINAL WARS (2004). Here he's a dormant, 12,000 year old intergalactic mummy. As much as I hate to say anything positive about GFW, Gigan looked spectacular in this with his upgraded, slimmer, heavy metal appearance -- even if his brief screen time had him doing incredibly stupid things. The upgraded Gigan (he is killed and reconstructed a second time) has a Gigeresque quality to his design. His weapon list include cables ejected from his scythe-like appendages that are used to pull enemies into his sawblade chest cavity. A cluster beam is fired from his eye, and his shoulders emit homing buzzsaw blades. In his second form, Gigan's scythe hands are replaced with chainsaws in the shape of claws. Kazuhiro Yoshida was underneath all the rubber. 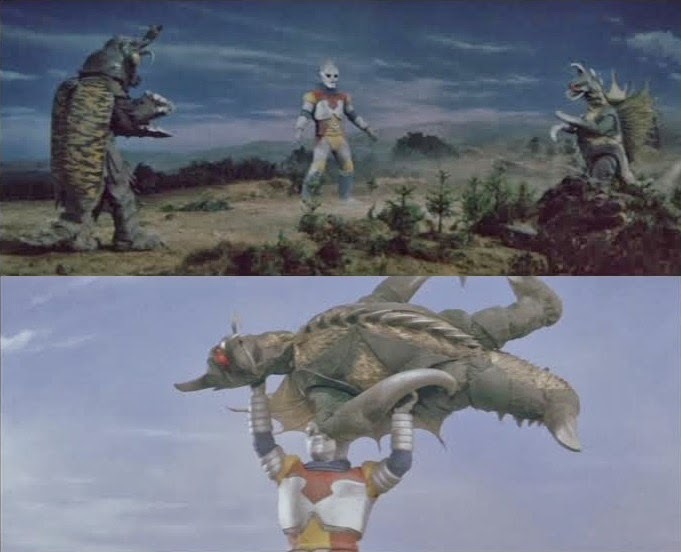 Megalon ties with Gigan for most bizarre Toho monster in a motion picture. This robo-roach from the subterranean world of Seatopia has pointed, metal hands that can combine to form a giant drill. 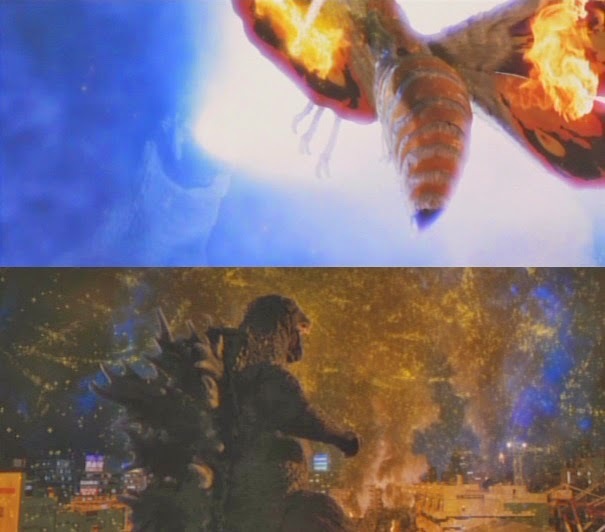 The Rhinoceros Beetle styled horn on his head fires a lightning bolt attack akin to King Ghidorah's (taking into consideration the use of some stock destruction footage, it IS King Ghidorah's lightning bolt attack). The outsized insect even spits out what can be described as potato shaped napalm grenades. Megalon also flies, but thankfully, this cockroach from beneath the Earth didn't spawn more Megalons. Hideto Odachi, under all that rubber, and a heavy looking headpiece, portrays Megalon with gusto even if his movie plays like an extended episode of ULTRAMAN guest starring Godzilla. 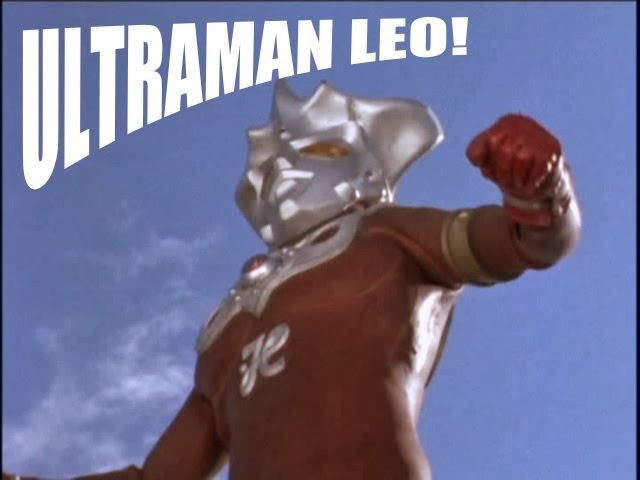 Speaking of the Ultraverse, Jet Jaguar was Toho's attempt at replicating an ULTRAMAN like success with a similar monster fighting hero. The result was a robot created by a scientist played by Katsuhiko Sasaki. JJ, who is anything but 'Dyn-O-Mite' has no major powers other than changing his size at will, flying ability, and bright highbeams that shine from his eyes. His fighting skill level is on a par with that of Anguirus, so it's more like a handicapped match for Godzilla. 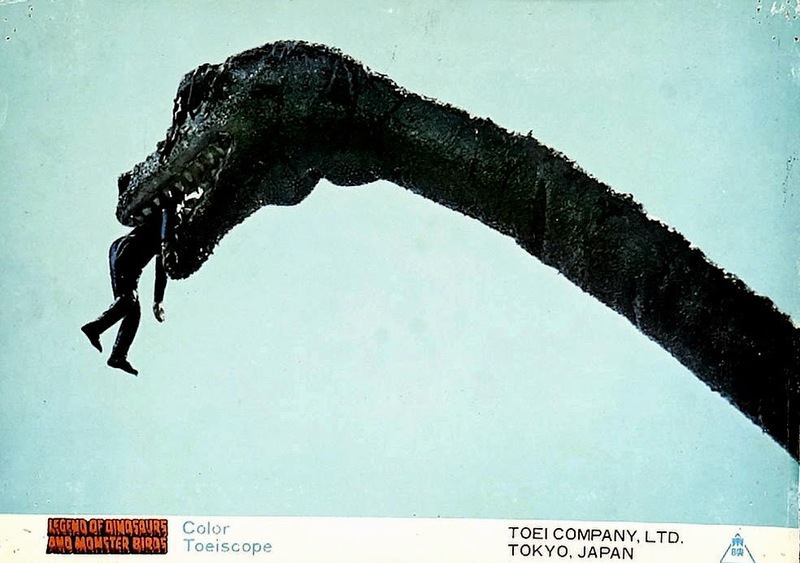 In keeping with the juvenile nature of GODZILLA VS. MEGALON, JJ was designed by an elementary school student, the winner of a Toho contest. Unfortunately, Tsugitoshi Komada never conveys a mechanized creation underneath the flimsy "robot" suit, even with an accompanying beeping sound. Jet Jaguar simply doesn't look much like a robot, either. He looks more like a masked wrestler late for his aerobics class. After receiving a massive throttling by the King of the Monsters, King Ghidorah is reconstituted in the 23rd century as a cyborg weapon. The now futuristic monster machine is then sent back in time to battle Godzilla. 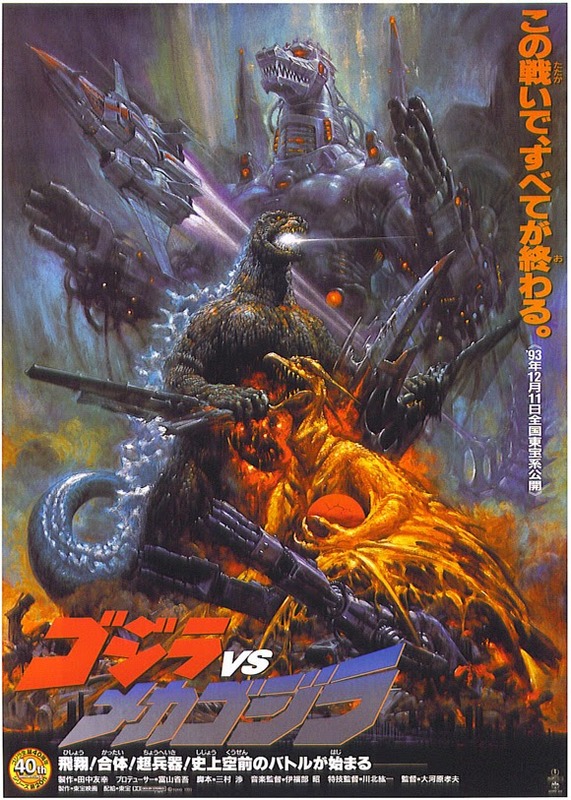 Mecha King Ghidorah is a highlight of the confusing, but entertaining GODZILLA VS. KING GHIDORAH (1991). Having lost a head and much of its wings during its first encounter with Godzilla, the Futurians fashion the beast with a new mechanical head, chest cavity, wings, and leg braces. Whereas the organic KG was controlled by aliens, Mecha KG is piloted by a human -- in this case, the lovely Anna Nakagawa. Its limited weapon set includes electrified cables and a G-Grasper, a giant claw hidden inside Mecha KG's chest. This was the first, and so far only appearance by King Ghidorah revamped as a robot. On a less monstrous note, Robert Scott Field portrayed the Futurian android, M-11. 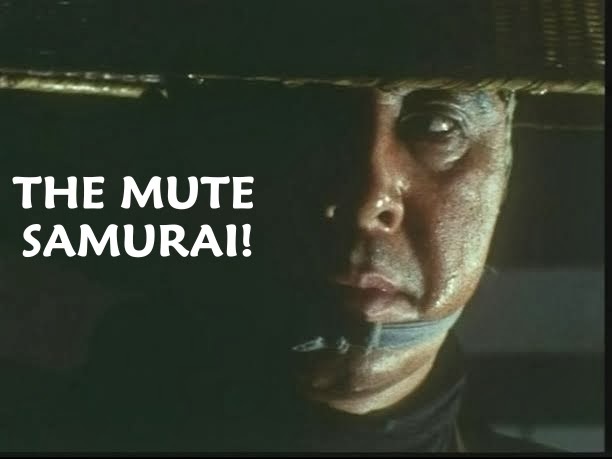 Despite stiffly reciting his lines (like most Anglo's in Japanese movies), Field's inexplicably manages to carve a memorable character for himself. One of the earliest, if not the first robot kaiju came in the form of the silly looking MONSTER MARINE KONG (1959), a cyborgian aquatic monster that looked like a lizard on the outside, but, according to those who've seen the show, had mechanical parts on the inside. An extremely rare B/W television series, MARINE KONG was reportedly produced by a Japanese puppet theater company, and ran for 26 episodes split into two cours, MONSTER MARINE KONG and REVENGE OF MARINE KONG. 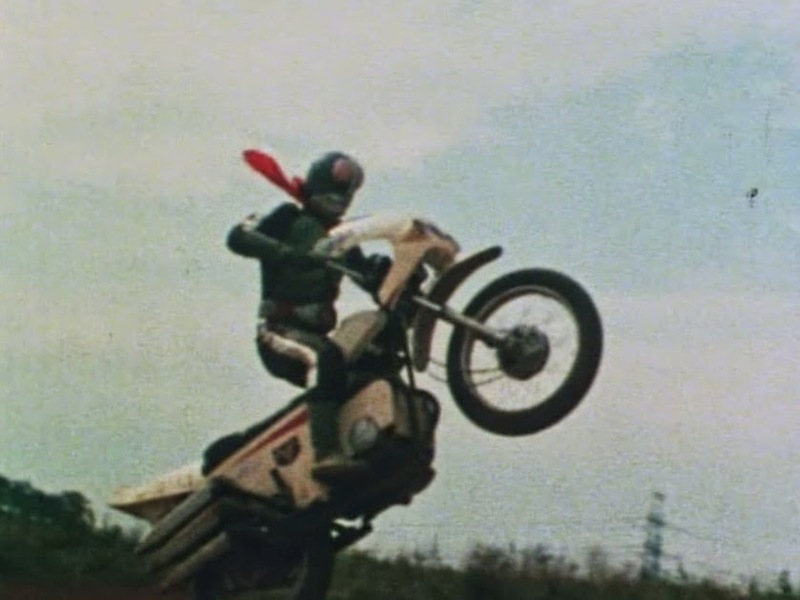 It was seemingly instrumental in Tokusatsu programming gaining momentum on television. Toys of the Marine Kong (made by toy company Shikaruna Kobo) seem to be almost as rare as the TV show. P Productions brought forth the transforming golden space giant, AMBASSADOR MAGMA -- a superhero who shot electric bolts from antenna on his head, and fired a flurry of rockets from his chest. It's a family affair, as Magma has a wife and son -- all of which transform into rocket ships. The main enemy is Space Emperor Goa, a fang-toothed, pointy eared villain with delusions of Earthly conquest. This series was unique in that it merged animation with live-action to get around its obvious budgetary limitations. 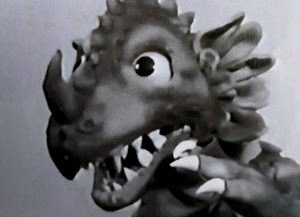 AMBASSADOR MAGMA began airing just a few weeks shy of ULTRAMAN's premiere, and ran for 52 episodes from 1966-1967. 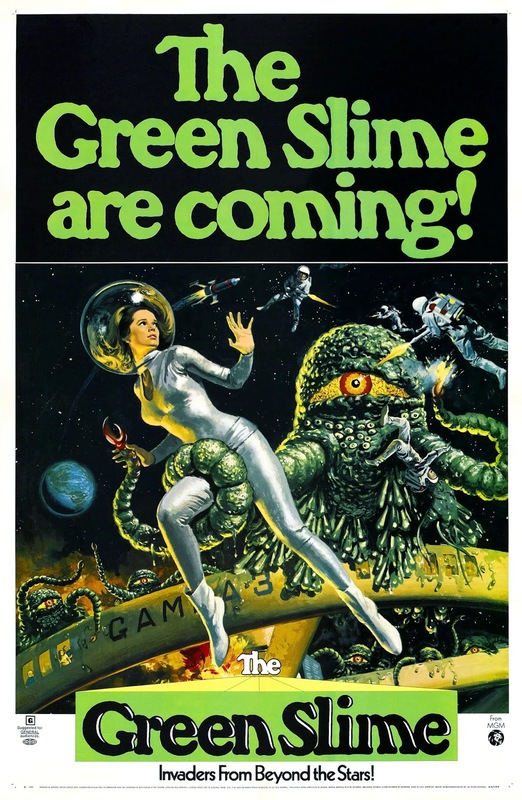 It was released here in America as THE SPACE GIANTS where it retains a cult following. Toei's GIANT ROBO (1967-1968) is among the most well known examples of live-action robo-theatrics. Christened JOHNNY SOKKO AND HIS FLYING ROBOT in America, this 26 episode series features an enormous robot bearing Egyptian features. 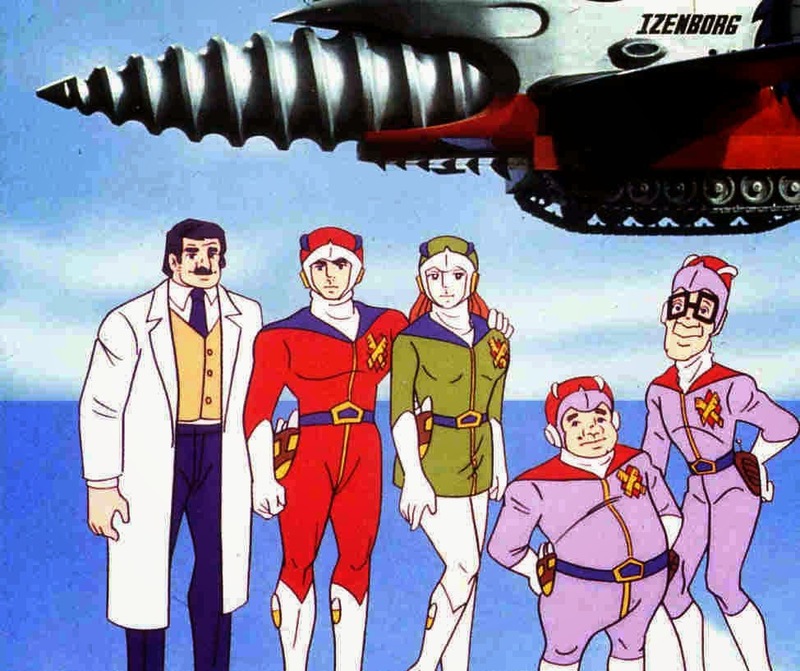 Built by an Earth scientist, the giant robot is ultimately controlled by the little boy, Daisaku, and the duo battle Emperor Guillotine and his army of monsters and evil robots. Giant Robo has a vast arsenal of rockets, flame attacks, and power moves. AIP condensed a number of episodes to make a movie out of the series as VOYAGE INTO SPACE (1970). Like MAGMA before it, SOKKO has a healthy, if small cult following in North America. 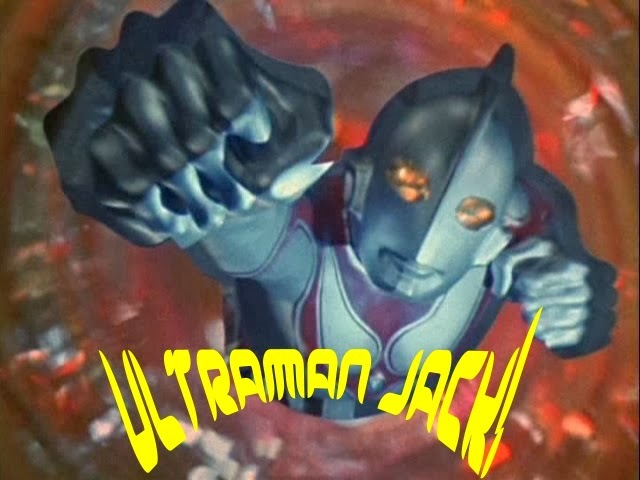 P Productions struck again in 1971 with SPECTREMAN, a 63 episode program that, like many others, took its cue from ULTRAMAN. The villains were a race of alien primates led by the sinister Dr. Gori. Like most SciFi at that time, the series had a thick environmental theme wrapped around the typical 'conquer the Earth' motif. 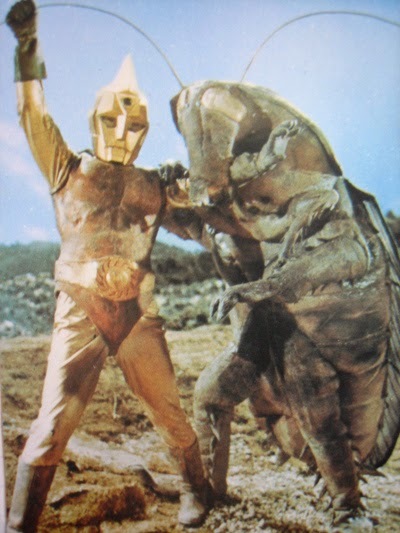 Spectreman was a cyborg agent from Nebula 71 (disguising himself as Earthling Joji Gamo) who fought against Gori's monsters with a number of energy attacks and bladed weaponry. 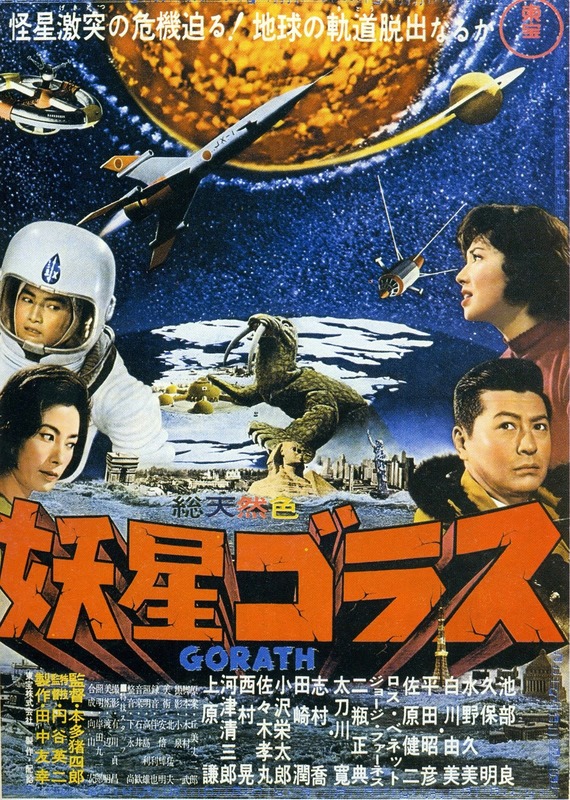 Spearheaded by the huge success of ULTRAMAN, this was another Japanese import that became a minor cult item among monster kids who were lucky enough to get their giant monster fix regularly on television back in the day. 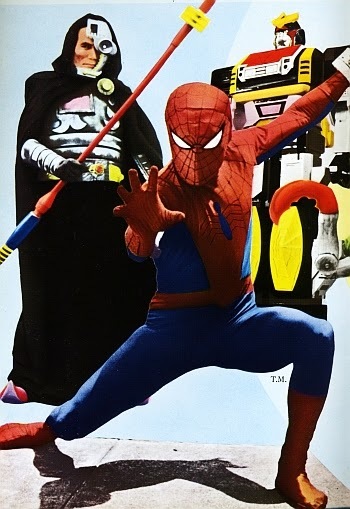 SPIDERMAN (1978) and BATTLE FEVER J (1979) were instrumental in popularizing the superhero/giant robot boom of the Super Sentai TV programs that emerged with extreme regularity. The former helped popularize the trend of piloting a giant robot to battle monsters on the small screen (backed by a kitschy disco theme). Spiderman fought both human sized, and giant beasts. 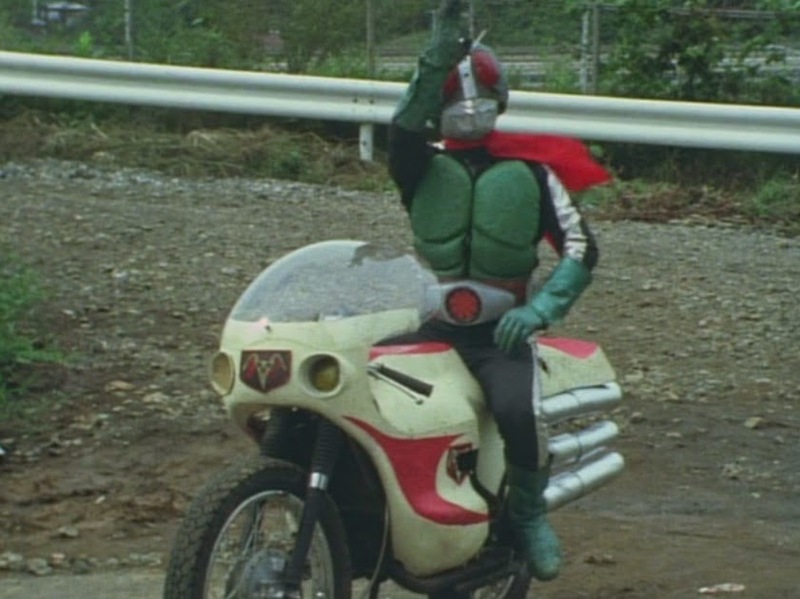 Nippon Spidey owned a snazzy SciFi car that could fly; it was also armed with machine guns and missiles. The Marveller was Spiderman's spacecraft that transformed into the giant robot Leopardon. 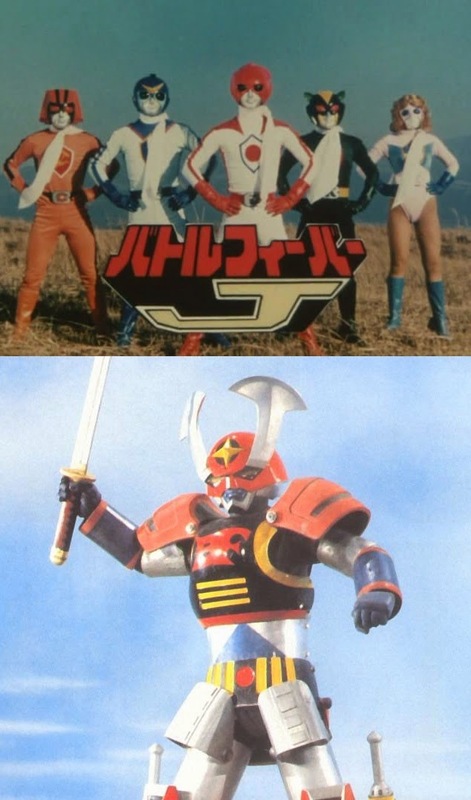 The latter series (the second in a deal between Toei and Marvel) was significant for being the first Super Sentai show wherein five colorfully costumed super heroes battle monsters and commandeer a giant robot. This template found its way to American shores in 1993 as MIGHTY MORPHIN POWER RANGERS -- a wildly successful series that built its stories around footage imported from Toei's KYORU SENTAI ZYURANGER (1992). 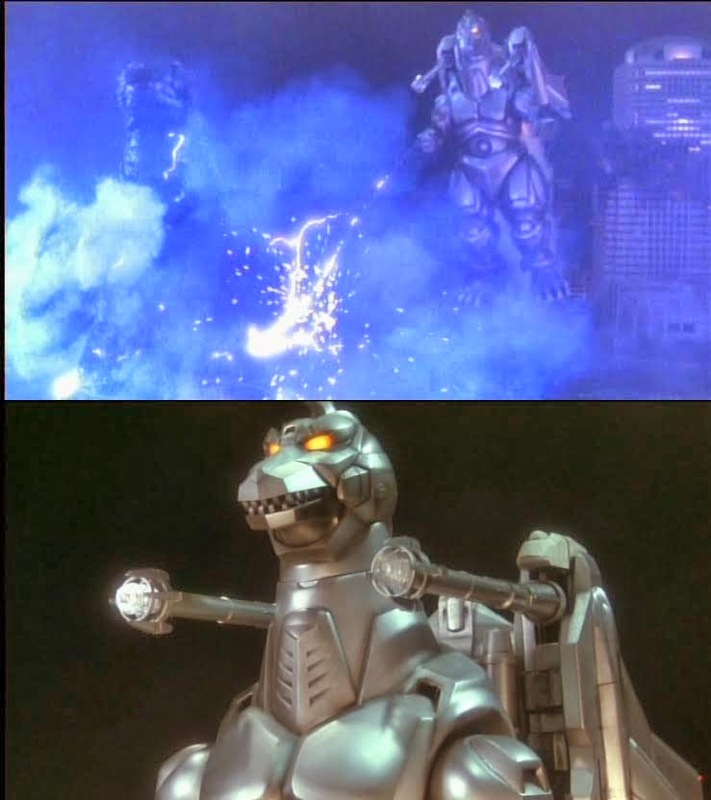 Of all the big robots in Toho's repertoire, Mechagodzilla is easily the most popular -- in addition to being one of the most popular giant monster antagonists ever devised. There were three versions -- the Showa (70s), the Heisei (90s) and the Millennium (00s) Mecha G's. The human architect that precipitated this galactic terror and its robotic mayhem in the two Showa films was Akihiko Iguchi. 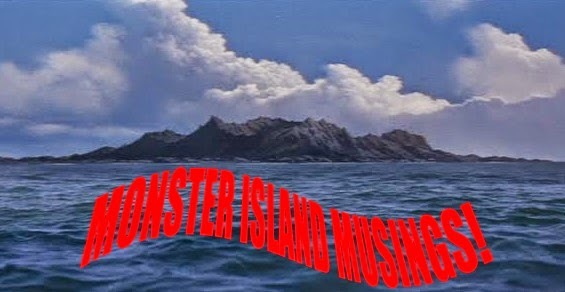 For that, many a monster movie fan are eternally grateful. 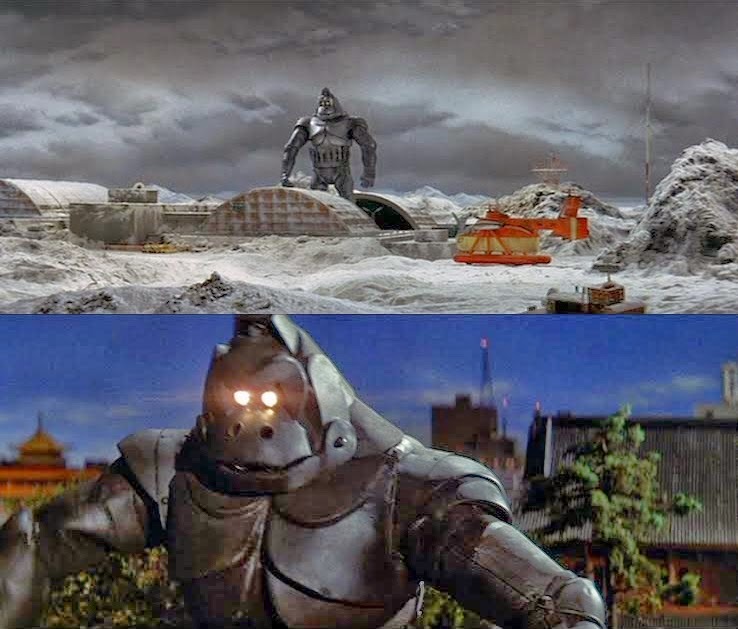 First seen in GODZILLA VS. MECHAGODZILLA from 1974, and again in TERROR OF MECHAGODZILLA the following year, the metal monster of the Showa period was built using Space Titanium by a race of alien apes masquerading as humans. An immensely impressive creation, MG was locked and loaded with an assortment of lasers and rockets that were fired from every orifice imaginable. 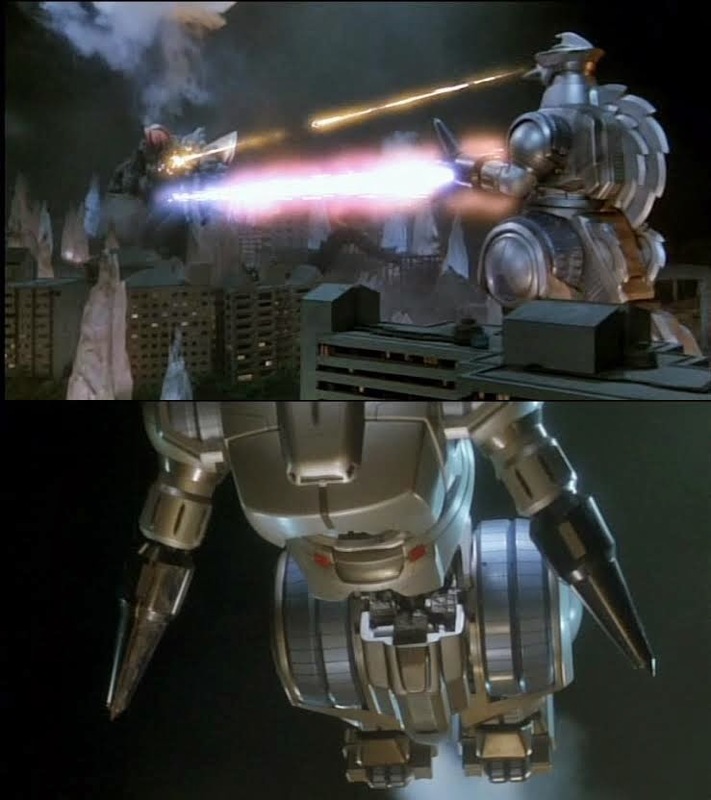 Originally concealed inside a "Godzilla skin", once the alien creation reveals itself, Mechagodzilla's capabilities enable it to fly, as well as engage foes both in front of, and behind it; it can also rapidly spin its head around generating a tornado-like force field that does damage if touched. Rockets are fired from MG's mouth, hands, knees and feet. Lasers are emitted from the eyes and chest cavity. The lightning bolt beam fired from its chest can slice through dense objects. Kazunari Mori was underneath all that heavy metal for the two MG movies of the 1970s. 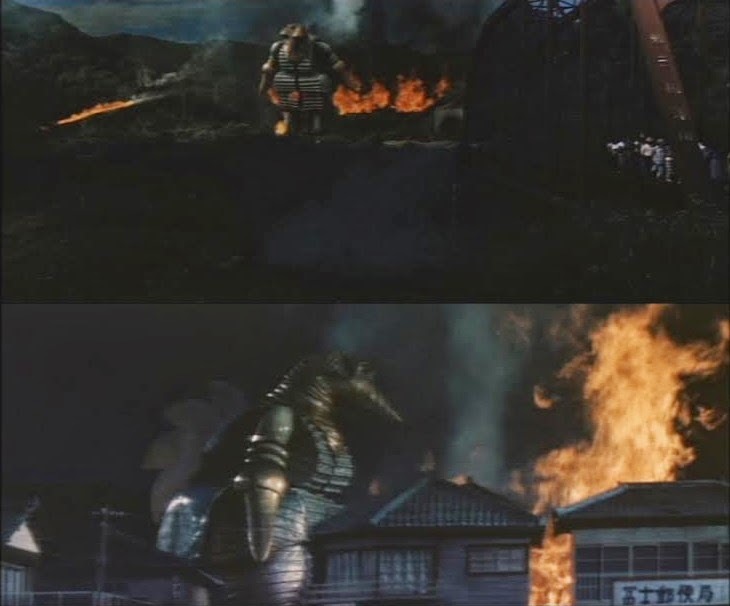 In the aftermath of the epic battle with Godzilla and the Okinawan god King Seesar, the wreckage of Mechagodzilla is recovered by the aliens from "the Third planet in the Black Hole, outer space". Rebuilt, and now known as MG2, this upgraded version is nearly identical with the additions of revolving missiles and a piercing beam hidden inside of Mechagodzilla's head. This revised version of the insidious machine is slimmer, less rough around the edges, and bears a blue and red 'MG2' emblem on its arms. The bright silver color of the previous film is replaced with a darker shade giving off a blackish hue. It looks like charcoal has been smeared over the suit, giving the appearance of battle scars. Working with an unusual script by Yukiko Takayama, she adds a melding of woman and machine to create an improved alien cyborg. By placing MG's brain inside the stomach of the female that controls him, the robot is deemed virtually indestructible -- so long as nothing happens to its host. The jagged, demonic appearance of MG would undergo radical alterations when it returned to the big screen 18 years later. 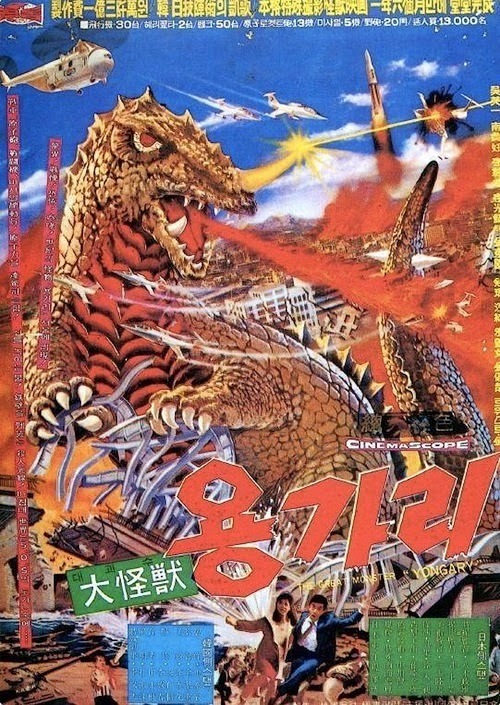 In 1993, Toho revived one of their most popular creations for the 20th entry in the Godzilla series. 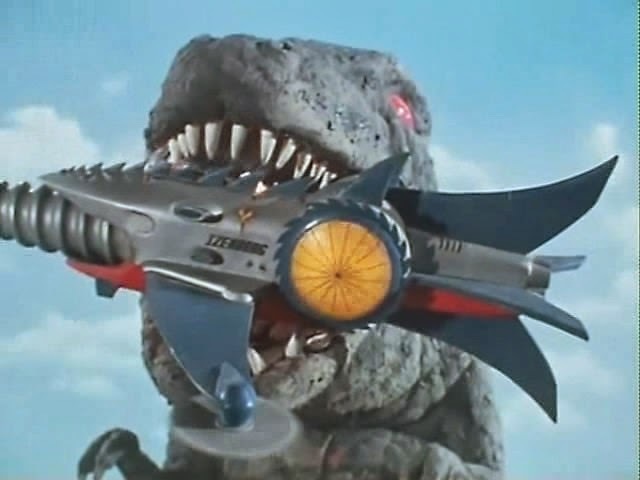 This new version of Mechagodzilla jettisoned its interplanetary origin by turning it into a G-Counter Weapon funded by the United Nations for use in their G-Force program. The design of MG in this movie (directed by Takao Okawara) is a mixed bag. Possessing a sleek, smooth outer shell (built using the Futurian technology taken from the remains of Mecha King Ghidorah), this benevolent looking, human piloted war machine has literally zero personality; but in its place there's numerous flashy lasers that make up the monsters anti-Godzilla arsenal. 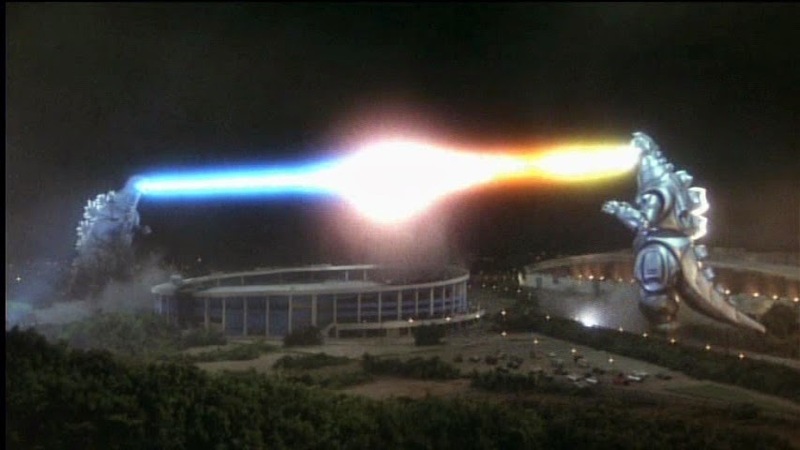 The outer coating of artificial diamond is a holdover from the Super X-2 first seen in GODZILLA VS. BIOLLANTE (1989); a weapon which absorbed Godzilla's flame attacks, reflecting them back in his direction. For MG '93, the absorption of radioactive flame is concentrated into the Plasma Grenade, a weapon built into MG's waist. Once gathered there, it's then redistributed back at Godzilla. 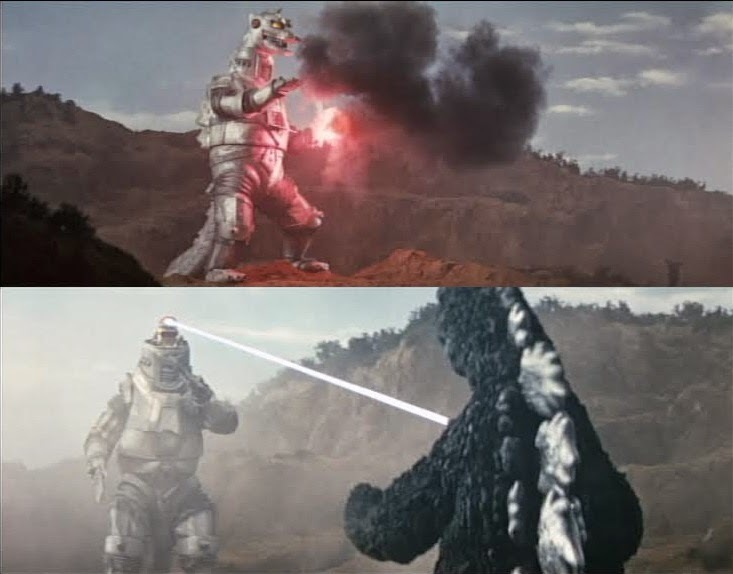 Tranquilizer missiles fire from its shoulders (later modified to be ejected from MG's hips), while Shock Anchors eject from its forearms -- a weapon that surges electric current into Godzilla's body. 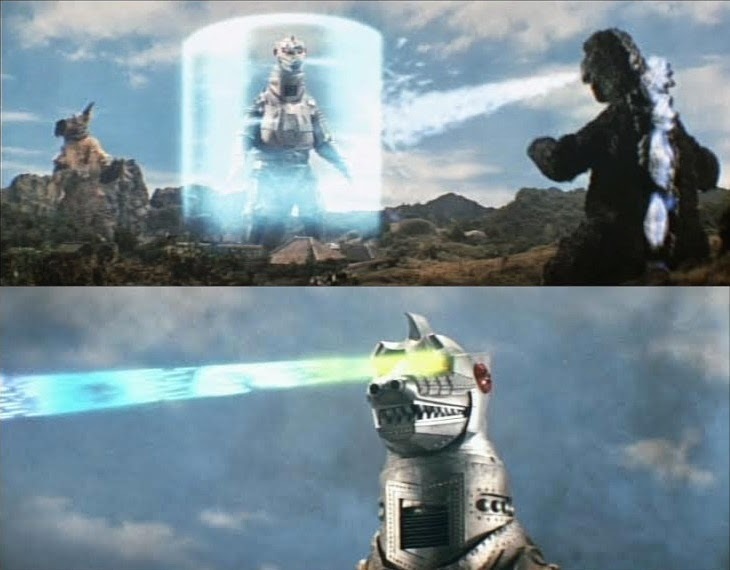 During the finale, the Shock Anchors become the G-Crusher, which will destroy Godzilla's spinal brain, permanently paralyzing him. 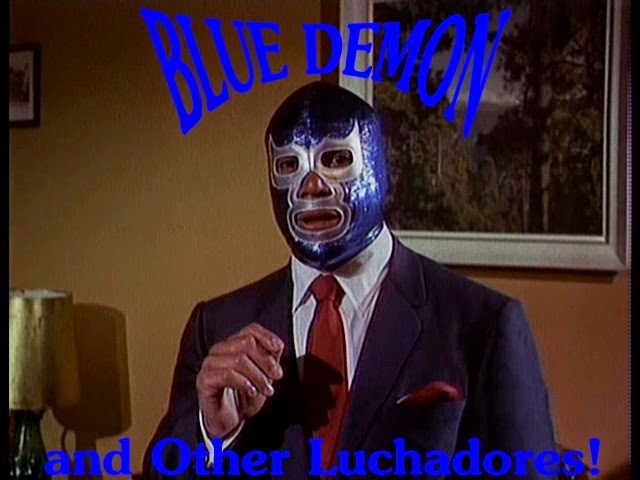 This was suit actor Wataru Fukuda's sophomore effort as a suit actor. He would play the robot M.O.G.E.R.A. in the following years SPACE GODZILLA. SPX artist Koichi Kawakita loved his laser beams, but a fascination with transforming mecha and monsters are here, too. A shelved Anti-G weapon, Garuda, is employed as part of MG's armory. Equipped with masers, the ship connects itself to MG's shoulders creating Super Mechagodzilla. With Garuda, MG is able to hover and fire its weapons cache in flight; something it couldn't do in standard flight mode. Additionally, GVM '93 ports over the android plot point from GODZILLA VS. KING GHIDORAH (1991) in the form of American actress Sherry Sweeney. She plays Lt. Berger, one of the MG pilots, and also an android. A sequence cut from the final version reveals this, yet her robotic line delivery of her few moments left in the film fail to give any hint of her android origins. 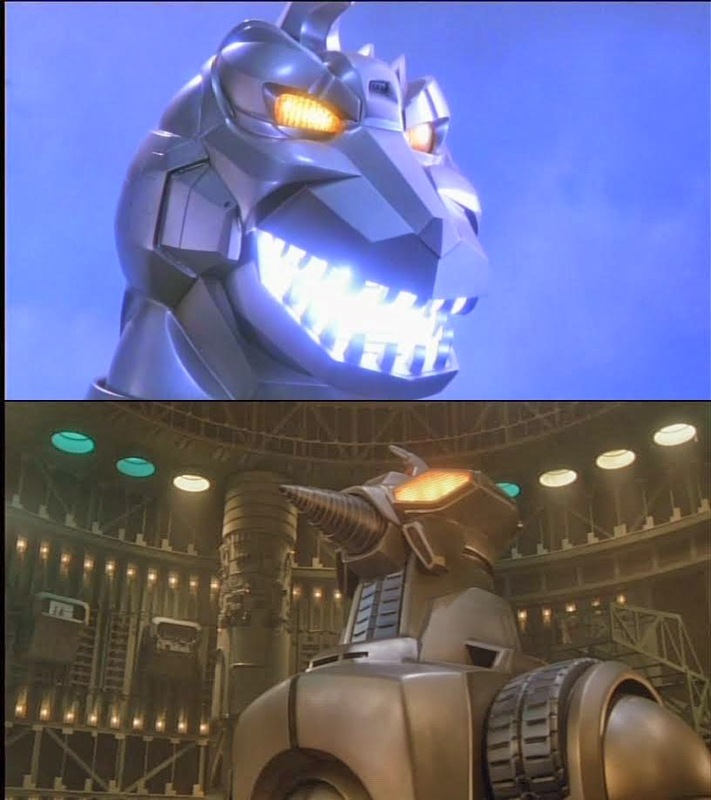 Less than a decade later, Mechagodzilla was primed for a return to the big screen in GODZILLA X MECHAGODZILLA (2002). With that sleek, friendly countenance now a thing of the past, Shinji Nishikawa envisioned a return to a much more serious look for MG. Streamlining the spiky, serrated constructure of the 70s version, the 2002 incarnation was far more impressive than its immediate predecessor from a visual standpoint. Like the '93 MG, this battle robot was man-made. But unlike the previous film utilizing futuristic tech for its blueprint, the '02 MG is constructed using spinal DNA from the skeletal remains of the original '54 Godzilla to create an organic, cyborgian monstrosity. Further differentiating itself from the Happy MG of '93, the upgrade is remotely controlled from a massive jet plane, the Shirasagi. There are three total, and when MG's batteries run down, the Shirasagi act as microwave receptacles to juice up Kiryu. Referred to mostly as Kiryu (Machine Dragon) in both of Maasaki Tezuka's MG movies, the maneuverability of the new Millennium's MG surpasses its forerunners. 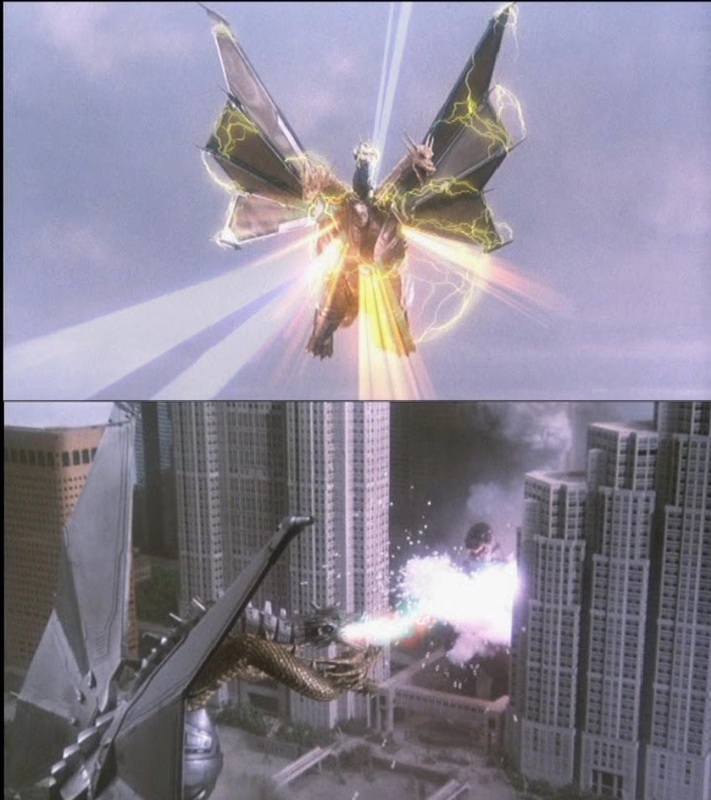 In flight Kiryu moves with a speed only CGI could provide, despite its enormous size. The bio-machine goes old-school and gets down with some close quarters combat when it isn't unloading its stockpile of rockets, homing missiles and dual wrist lasers. A hidden sword that emits electric current is sheathed within its forearms. The main armament of interest is the Absolute Zero Cannon -- a powerful freezing weapon built into MG's chest. Inside MG is Super Sentai performer, Hirofumi Ishigaki. He plays Kiryu far more energetically than Wataru Fukuda was allowed to do in the '93 MG -- which favored rainbow colored laser attacks from a distance. 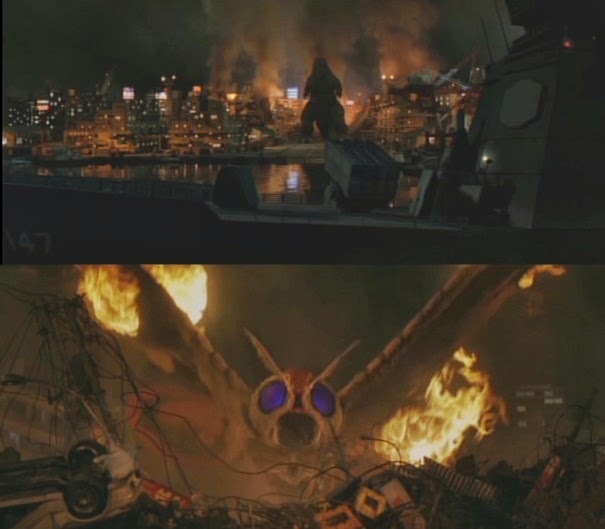 The following year brought a direct sequel with GODZILLA X MOTHRA X MECHAGODZILLA: TOKYO S.O.S. (2003). There was little difference between this Kiryu and its immediate antecedent. Since both films take place a year apart, MG is still being repaired after suffering serious damage leaving the bio weapon only 64% operational. When Godzilla unexpectedly shows up, Kiryu is pressed into action. 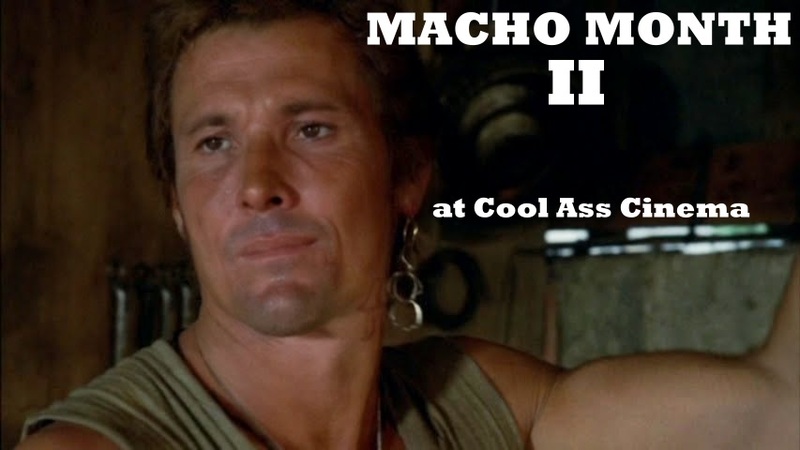 Unfortunately the Absolute Zero Cannon isn't combat ready, either. The freezing weapon is scuppered and a giant 3-Way Hyper Maser takes its place. The jet pack/rocket cache is also modified, and given a more militaristic look. One of MG's hands is altered to transform into a giant drill that sends bits of Godzilla flying all over during the final battle (that takes up 3/4 of the films running time). Mimicking the 70s MG movies, the color scheme is altered between the two Millennium pictures -- Kiryu was silver and blue in the '02 film, and goes for a silver and black look for the sequel. Another Super Sentai suit actor, Motokuni Nakagawa, was inside the impressive looking Kiryu costume. 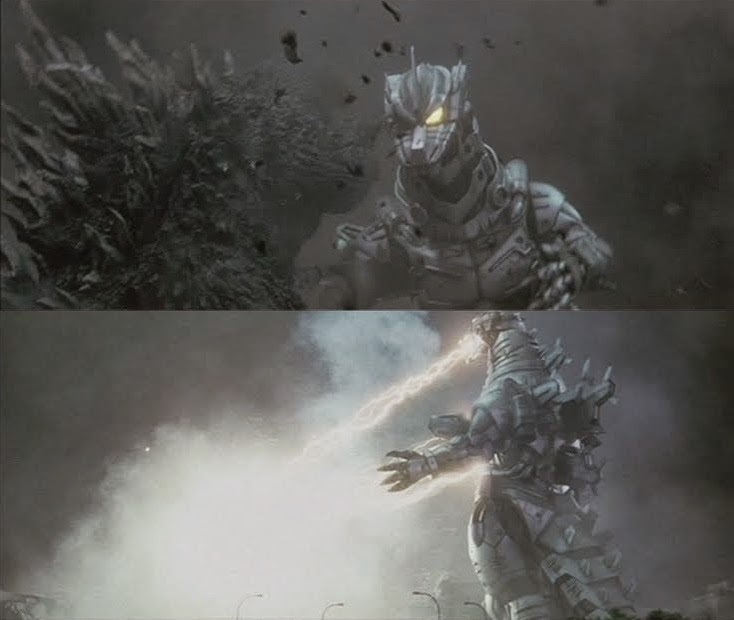 The last two mechanized Millennium movies were very exciting, and it's a shame we got GODZILLA FINAL WARS (2004) as the series swan song as opposed to a third Kiryu adventure. America did jump on the Japanese style giant robot and monster melee bandwagon with PACIFIC RIM (2012). Lovingly directed by Guillermo Del Toro, these robots were likewise man-made, and battled reptilian creatures from the deep sea. 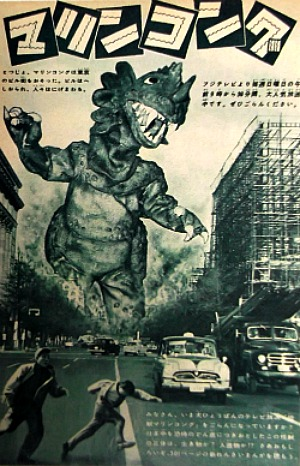 A sincere homage to Japanese kaiju cinema, the film wasn't the monstrous success it was hoped for, and it surprisingly failed to capture the imaginations of Nipponese audiences. With all the weird and wild examples of robotic and cyborg monsters in Japan's illustrious history of science fiction in cinema and television, it's a shame we never got a Mecha Gamera movie. At least not yet.